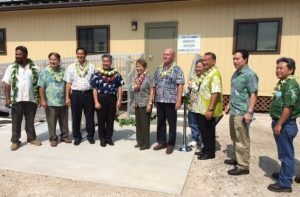 KONA – The Hawaii Department of Transportation (HDOT) celebrated the completion of the Kawaihae Harbor Pier 2 Terminal Improvements Project in a dedication ceremony earlier today. The new improvements re surfaced 3.1 acres of cargo yard area at Pier 2, relocated the Harbors Division Office/Maintenance Facility and comfort station structures and made infrastructure improvements to lighting, fire-protection and drainage at an approximate construction cost of $7 million in state funds. Energy-efficient LED lighting fixtures were added to the cargo yard area, along with photovoltaic panels on the new structures to help reduce energy usage. Approximately 80-percent of all goods are imported into the state, and of that total, 98-percent arrives through our commercial harbors.